Governor Roy Cooper this afternoon appointed Associate Justice Cheri Beasley as the first black woman to head the state's Supreme Court, replacing Republican Mark Martin who is stepping down. Beasley has been a judge for the last 20 years and an associate justice on the Supreme Court since 2012. Beasley's associate justice seat on the court will now be open, and Gov. 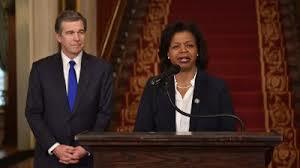 Cooper will also be able to appoint a replacement for her. The only Republican left on the high court, Justice Paul Newby, was miffed that Cooper did not elevate him to the chief justice position because he has the greatest seniority. Newby had already announced weeks ago that he would be on the ballot in 2020 for the chief justice seat. He'll likely be opposed by Cheri Beasley, who will have to run in her own right for the seat next year.